Rent our Classic lakefront vacation rental home at Victoria, British Columbia. This house is the longest listed VRBO listing in Victoria, and has been enjoyed by hundreds of guests. Located on the southern tip of Vancouver Island, B.C. Victoria - 'the Garden City' has the mildest climate in Canada, is the sunniest place in B.C., and is the premiere year round tourist destination spot of the Pacific Northwest. This charming house is a great place to spend some time enjoying the fishing , swimming , or just relaxing watching all the wildlife and boaters (no gas engines) pass by your lawn chair. NOTE/ JUNE 28-JULY 07 min 7 nights Sunday checkout not required....email for info. It is the oldest VRBO listed rental in Victoria, and has been enjoyed by hundreds of people over the last 16 years. Only 5-10 minutes from Royal Roads University, It is situated at the end of a quiet dead-end road,that leads into a wooded walking trail. The house is only steps from lakeside, sunny exposure, very private , great swimming and fishing from the yard. The kitchen is equipt with full size stove, fridge, microwave, dishwasher, lots of small appliances, dishes, pot/pans etc. There are 3 comfortable bedrooms with queen size beds, all beds have good quality linens, there is 1 full bathroom with a tub/shower, and 1 full bathroom with a shower. The house also has a full size laundry room. ** Twin Bunk Beds. These Bunks are in a private corner of the house and are perfect for kids or adults (max 6'2'). Also we have a gas fireplace Lakeside for fun evenings by the lake. Downstairs is a large games room overlooking the lake, there is a Hideaway Couch ,its a great place to relax or play a game of ping pong,. The room leads out onto a private covered sitting area overlooking the lake....'a great BBQ spot'.. The lake front is a private yard with great sitting and lounging areas, plus you have your own dock, a boat for your use, and Gas fire pit. We also have a swimming float anchored out front. PLEASE NOTE THERE IS NO TAX ON RENTALS 30 DAYS OR MORE.... the site will add tax but I will correct it. The one constant comment weve had on our lakefront houses is that they are in a perfect locations, only minutes from all the city has to offer, but in a quiet location where you can come and relax. Its'the best of both worlds'. Only minutes from your door are local shops, restuarants, pubs,casino,theatre, and malls. The other side of the lake is a linear park and you can hike it by a boardwalk at the end of the road. 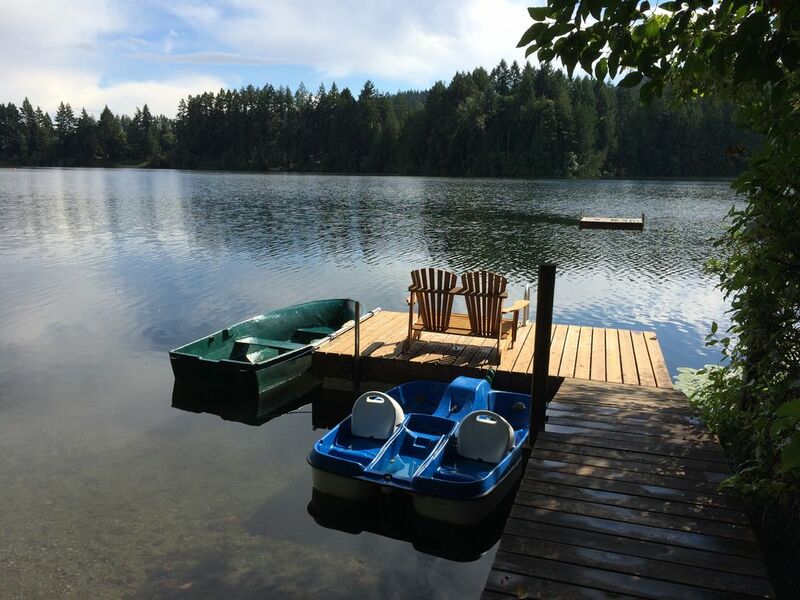 Langford Lake has excellent swimming, trout and bass fishing, with fish caught up to 9 lbs. ,or just relax and watching the sunsets across the lake. There are no gas motors allowed on the lake, so its a great place for rowing around (boat provided). Goldstream River Provincial Park is only five minutes away by car, the park has excellent hiking and walking, waterfall viewing, and salmon spawning in the fall. The great thing about these houses is you can enjoy the country, but can be in the heart of the city within 15 minutes. There is cosmopolitan dining, superb shopping, world class museum, salmon fishing, whale watching, Butchard Gardens and the wild and beautiful pacific coast beaches surrounding the house. Also there are 3 top golf courses, Casino, movies, water park, kids park etc. within five to ten minutes of the house. Our lake houses are a great family vacation spot, but they are also very popular with couples or friends traveling together. We try too have everything that you need here for a special holiday. My wife and I come from families that have resided in Victoria for over 100 years. We have lived on Langford Lake since 2001, and in this area for over 40 years. We purchased this house ,and the one next door in 2001. At the time we owned a lake front vacation home on the gulf islands, and we wanted to live full time on a lake. When these homes came up for sale we knew that we had found our dream location to live. Langford lake is a perfect place to live, as its only minutes from the city, but when your here it seems like your way out in the country. The fact that we can fish, swim and boat from our yard doesnt hurt either! This House is the Oldest Victoria Listing on VRBO. When you stay here you are close to everything , but in a great getaway that lets you relax and enjoy the lake and nature.The walking trail just down the street, is a great feature that alows you to walk around the lake. We constantly have bald eagles, otters , mink , ducks , geese , swans and more around our yard. Langford lake has some of the best bass and trout fishing on the south island. One thing we have always loved here is the fact that there are no gas motors allowed on the lake, this makes it much more enjoyable as your not being buzzed by jet skis and big boats. From this house you have everything from fine dining, a casino, ocean beaches, shopping, a provincial park and several major golf courses all within 5-15 minutes away. No matter what your interests you'll find its not far from here. 2 bathrooms on main floor . 1 with tub/ shower and 1 with shower. This house has a private yard on the lake. There is a dock with a boat. great swimming and fishing from yard. Lots of dishes glasses etc. Outdoor patio area, Gas BBQ., Lake side table and chairs, Gas fire pit, Boat and dock, also Swimming float anchored in the lake. Awesome house and great view! My family and I had another wonderful time staying here. We visited last spring too. Roy and his dog Dave stopped by to welcome us and to make sure we have everything we needed. The house is very comfortable and very clean. The view of the lake is fantastic and we had a lot of fun fishing off the dock. Plenty of outdoor seating to view the lake from all around the house. We enjoyed playing ping pong in the basement game room and it was very convenient to have a washer/dryer. It truly was a home away from home vacation. Thank you Roy for allowing us stay at your wonderful home! Thank you for your visit. It was a real pleasure meeting all of your family, and you are all more than 5 star guests !! We were very satisfied with our stay at the lake house. Great location and stunning nature all around the area. Also good communication with the homeowners and we felt very welcome. We had a delightful stay at the lake house over Labor Day. It was very clean and comfortable. The mattresses were a little soft and could use updating but that was the only negative. We loved the quiet neighborhood and the beauty of the lake. Thank you for your visit and comments, it was a pleasure meeting you all. This week we are replacing the upstairs carpeting to refresh the house, and have also started our Mattress replacement plan. Hope to see you again another day. Take care Roy and Val. It’s been a very pleasant stay. Nice and beautiful place with everything you would need. Beautiful outsede deck by the lake with cozy picnic area. Thank you for your visit and your comments. Hopefully we will see your family again another day. A wonderful place to rest, recreate and live! I did like almost everything here. The beautiful quiet lake is perfect for fishing, boating, roving and sunbathing! Or just may want to relax in the sunshine and read a book. The rental is big enough for a big family and has a pleasant atmosphere although I found the furniture rather old. Val and Roy are cool and friendly landlords. They, re ready to help, so don,t hesitate to ask for. You, re gonna, enjoy your stay no matter short or long. Unique house on beautiful lake! An interesting older home that is sort of cobbled together but comfortable and clean. The view of the lake, especially from the lower yard is beautiful. Unfortunately for us older folks there are many stairs and for one of us, who had a leg problem, she wasn't able to get down to the yard to see the beautiful lake view. This would be a good house for a family who is agile as there are several different levels and the outside steps and yard are very uneven. Also whomever sleeps in the top level bedroom has to go down quite a few stairs to get to the bathroom. If we had had the time we would have loved to try out the paddle boat! Hosts are great and very helpful! We all found the second stair to the lower bath to be somewhat of a hazard as it is shaped strangely. The basement level is sort of like being in a cave with it's stone walls! The living room is a bit small with seating for 5 people, there is one smaller bedroom but the other 2 are good sized and the bunks for the kids are great! The baths are all shared. The house is in excellent shape and well taken care of and nicely secluded for peace and quiet! Great place for families and kids! Thank you for your comments. We were glad you enjoyed your stay at the lake . Golf ( 3 top courses within 5 -10 minutes), Casino within 5 minutes, kids park with mini golf 5 min away,around lake hiking trail 100mtrs/yards from house. RATES include rent, and final cleaning. JULY AND AUG ARE ONLY RENTED SUNDAY TO SUNDAY high Summer ... rentals are 7days or 14 days or 21 days only June 28 - July07 may be rented for min 1 week but checkout doesn't have to be sunday ... email for info PLEASE NOTE IF YOU BOOK 28 NIGHTS OR MORE THE TAX RATE QUOTED BY THIS SITE ARE PROBABLY TO HIGH .... WE WILL ADJUST YOUR QUOTE .....NO TAXES AFTER 30 NIGHTS!! Monthly Plus extra $175 for Utilities Nov - April CONTACT OWNER FOR MONTHLY QUOTE . NO TAX on monthly ***CANCELLATION POLICY: If more than 90 days from booking full refund. If less than 90 days until booking arrival Guest is responsible for full rental amount. If the owner can re book property monies will be refunded on a dollar for dollar basis minus cancellation fee of $200.